1.) First, find out if there are any injuries. If so, obtain immediate medical attention for the injured. 2.) If no one has been seriously injured, determine whether the car is creating a dangerous road condition. If so, drive it safely off of the road. 3.) 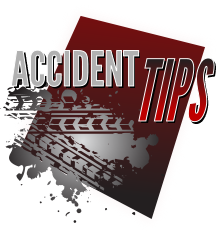 NEVER DRIVE A VEHICLE AFTER AN ACCIDENT THAT MAY BE UNSAFELY DRIVABLE. If there is any interference with the functioning of your tires or wheels; if the vehicle is leaking any fluids, or you may believe there is any concern with the basic operation of your vehicle, do not attempt to drive it. In such cases, contact us immediately and we can get you a tow from the scene. Either the person responsible or your insurance company will pay for the tow. If you intend to drive away from a front end collision, do not open the hood. It may be difficult to close. 4.) Exchange information with the other drivers such as names, addresses, registrations, insurance with policy number, phone numbers, and so on. 5.) If neither driver is willing to admit fault, don’t argue about it. File a claim under your collision coverage and your insurance company will settle the dispute in a process known as subrogation. If the other party was determined to have been at fault, your deductible will be refunded. 6.) If there is no doubt about the other party being at fault, you may submit your claim to their insurance company. In such cases, their insurance company must pay 100% for the repairs to your car and provide alternate transportation while your car is being repaired. 7.) Get names, addresses, and phone numbers of witnesses if possible, particularly if there is potential negligence or dispute over fault. 8.) IT IS THE LAW! Repairs to your vehicle can be made at any shop of your choice. 9.) If your automobile is being towed, you still have the right to select the shop you desire and you should not be forced to go elsewhere. You need to feel comfortable with your safety. 10.) You are only required by law to obtain one estimate. Stop by, we’ll inspect your vehicle for free. 11.) Please note that there can be significant differences between repair shops in regard to how repairs are done and the results in quality of work. Poor repairs can affect your vehicles value, safety, operation, warranty and lease turn-in.